Step 1: Apply by starting in the center of your upper lip. Packaging: Elle 18 Lipstick comes in a black sleek packaging with a clipart of girl’s face. The bullet looks quite sturdy and the cap is nicely secured and doesn’t fall out easily. Colour & Texture: Selfie Red is a Bright Red shade which you can’t go wrong with. It has a warm tone which will suit every skin tone people as we have more warmth in our skin tone. Talking about the texture, the name says its a matte lipstick but it actually is semi-matte. It doesn’t get dry on lips which I like for the fact that I have very dry lips, and in this case, I need no lip balm underneath my lipstick. 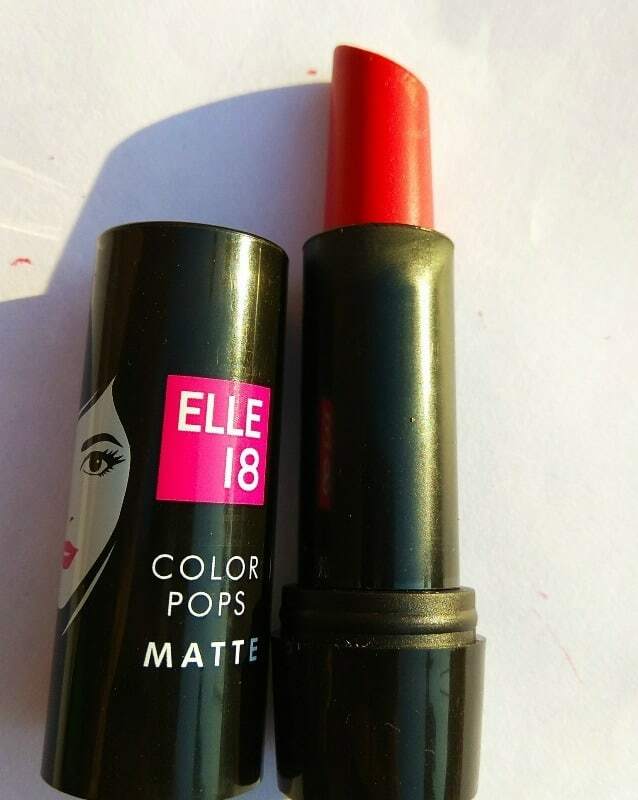 Fragrance: Elle 18 lipsticks have a fruity scent not very strong but I’m sure people will like it. Experience: Selfie Red is a safe red shade which does not have any pink or orange undertone to it. 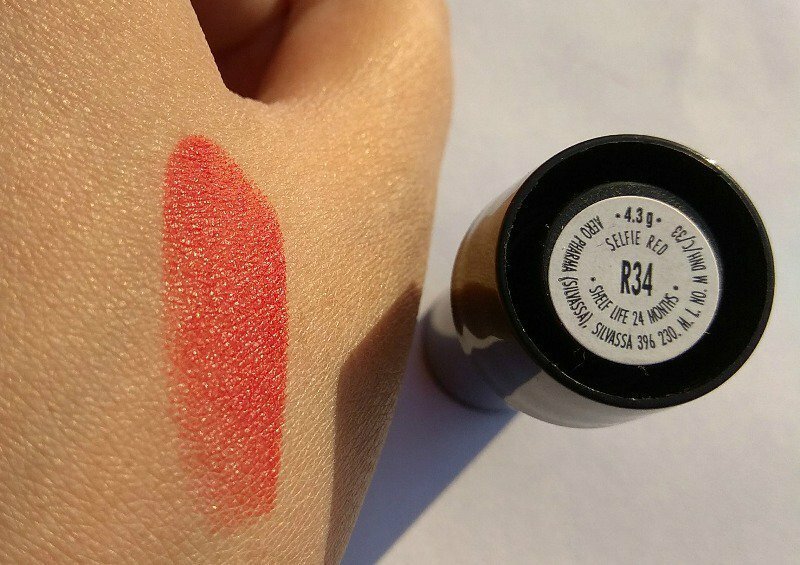 Rockstar Red from the same range is a red shade with pink undertones in case you love pink undertone reds. This lipstick transfers a little as it has semi matte texture. It stays for a good 5 hours followed by a light meal, and after that, it leaves a tint on lips. This shade is pretty wearable in a daytime as well as night time, and you also need to carry that confidence to wear this bright shade especially in the daytime. This Bright Red will look beautiful with ethnic dresses and for the times when you wanna go bold with your makeup. Yes, I will recommend this lipstick if you want a good rich warm red shade which is pocket-friendly. For its Colour and Price, Yes I will repurchase it. I wouldn’t mind spending money on this. 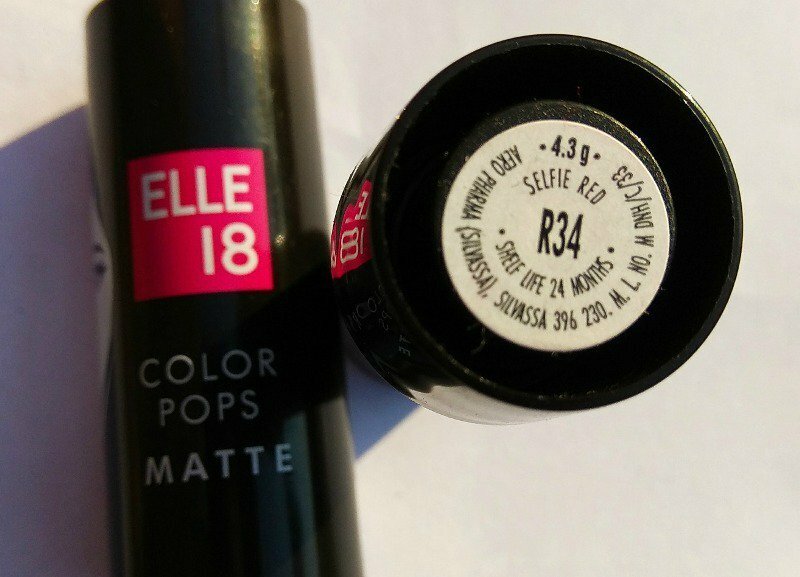 Elle 18 Color Pops Matte Lipstick Berry Crush is Vampy Pretty! I really like the color. Its kind of very grand but yet subtle. A classic red from Elle 18.. This one is worth a try..